"great characters, great premise, exciting ghosts and I Cannot Wait till the next book, when more about the very charming Anthony Lockwood, and more about the geekily appealing George, might be revealed! We already know Lucy pretty well, but I'm curious about how her relationships with the boys might change..."
And now I have just finished the fifth and presumably final book in the series, The Empty Grave (Disney-Hyperion, Sept. 2017), and I have all the answers, and an ending has being reached, and all is well (though "the Problem" of the ghost is still troublesome). 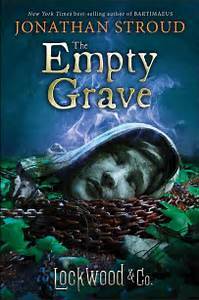 So from that point of view, The Empty Grave is a very satisfying book, and I was delighted to read it. Unusually for me, I find the exciting bits of these books more interesting than the character building bits, perhaps because the exciting bits (hunting ghosts), contain mysteries and team dynamics as well as just the adventures. From a more critical point of view, it's not the best in the series--it's a bit bogged down by the gang siting around trying to figure out what to do, as opposed to actually doing things. It wasn't until about 2/3 of the way through that it became the page turner I was expecting it to be. And I got really fed up with George's overweight physique being presented as something to laugh at; it's the sort of body shaming that makes me not want to recommend the books to any plumpish geeky boys, because it will make them (I imagine) feel bad. It is also not a diverse bunch of characters, although it is strongly suggested by the end that one of the main characters is gay. But though it's not perfect, I continue to recommend the series with conviction--give these books to the 11-13 year old "reluctant reader" and they will be read. I speak from personal experience here; my own son, who is now 17, is getting this for Christmas and will be very happy. That cover gives me the chills. Thanks for your review. Maybe I will check this series out. It really truly is a good one!